Detailed map of Schönsee, Jamerau, and Culmisch Dorposch. Schönsee (also known as Schoensee, Schönsee bei Culm; now Sosnówka; coordinates: 53.412222° N, 18.616111° E [53° 24′ 44″ N, 18° 36′ 58″ E]; population in 1910, 166, in 2012, 210), a village in Poland, from 1772 until 1919 belonging to West Prussia, situated ten miles north of Culm about two miles from the right bank of the Vistula River, where Mennonites from the Netherlands settled as early as 1553 to reclaim and drain the swampy lands along the Vistula, being the first Mennonite settlement in the Culm region. The first land lease is lost, but a second one, of 1594, between the city of Culm, to which this territory belonged, and the farmers, still exists. In this and following leases only farming was allowed to the settlers; no handicrafts were permitted except weaving, tailoring, and shoemaking for private use. They were allowed to fish in the Vistula. The settlers, who lived at Schönsee and also in the surrounding villages and hamlets such as Jamerau, Dorposch, Lunau, and Schöneich, were explicitly granted the privilege of free exercise of their religion, including teaching in schools. The following Mennonite families are named in the land leases in 1695 and after: Unrau (Unruh), Siefert (Siebert), Hube(? ), Block, Voth (Foth), Funk, Jans (Jantz), Buller, Köhn, Sperling, Stephan (Stevens, Steffens), Wilhelm (Willems), Boltz (Bolt), Stob (Stobbe), Tomasche (Thomsen), Meister, Decker, Penner, Brümmer(? ), Mentz, Schümann (Schoman), Frantz, Abraham (Abrams), Pödker (Boetscher), Voutsche(? ), Siedau(? ), and from 1725 also Nickel, Bartel, Schröder, Nachtigal, Weitgraff (Weidegraf), Pancratz, Arndt (Arentsz), Eckert (Eggert), and Plener (Plenert). Besides these there are found in the list drawn up by Elder Hendrik Berents in 1719 the names of Schellenberg, Isaack, and Riggers (Richert). Since a number of these names are not Dutch-Frisian, other settlers must in the meantime have joined the original settlers. As early as about 1570 there were two Mennonite congregations at Schönsee, one Flemish, whose meetinghouse was called "die kleine Schule" (small school), which sided with the Groningen Old Flemish, and one Frisian (also called Waterlander), whose meetinghouse, built in 1618, was called "die grosse Schule" (large school). They are small and very plain buildings (pictures in Siedlungswerk taken in 1940-41). Concerning the early history of the Mennonites of Schönsee there is not much information. Social and religious development seems to have been favorable in the 16th and 17th centuries. Sometimes they were struck by calamities like floods and crop failures, but their tenacity and energy, and aid from their benevolent landlords, the city magistrates of Culm, easily overcame their blows. Both congregations of Schönsee were small in membership; the Frisians, concerning whom there is no further information, formed the larger one; in 1719 the Flemish numbered 48 baptized members. This Old Flemish group then belonged to the same congregation as Przechovka (Wintersdorf) and Konopath on the left bank of the Vistula in the territory of Schwetz, and Posterwolt on the right bank. Although Schönsee was a part of this congregation, it obviously had its own preachers by this time. In 1760 a separation was made for practical reasons. Schönsee then became independent and its preacher Laurens Sperling was appointed elder. Repeatedly the Flemish Mennonites in this area were visited by elders from the Netherlands; mentioned are Jan Siebes (Seebes), Gerrit Roose, and Stieve Sand(?) in 1676. About 1700 Alle Derks, the noted elder of the Old Flemish congregation at Groningen, visited the Old Flemish congregations in Prussia, including Schönsee, and in 1719 and again in 1733 Elder Hendrik Berents (Hulshoff) was in Schönsee to perform baptism and administer communion and also to exercise church discipline. Of his visit Hendrik Berents made a circumstantial report, mentioning the names of the members and their conditions. In 1727 a few Mennonites of the Frisian (Waterlander) branch, who had been expelled from East Prussia, settled near Schönsee. Among them were Heinrich Nickel and Gabriel Frantz, both preachers. They corresponded with the Dutch Committee for Foreign Needs at Amsterdam and both their letters and copies of the answers to these letters are in the Amsterdam Mennonite archives. This correspondence affords a clear idea of the situation of the Mennonites in this area about 1730. Both congregations were then using the same meetinghouse and the preacher of the Frisians, in the letters always called Waterlanders, was Derk Wichert. About this time the Catholic bishop of Culm insisted on harsh measures against the Mennonites, which could be prevented only by paying heavy taxes; they lived in constant fear of expulsion. The estates were flooded by the Vistula, and there were many years of crop failure and even of famine. The Dutch Mennonites supported their coreligionists in these misfortunes. In 1765 a number of Old Flemish Mennonites from Przechovka and Schönsee moved to Brenkenhoffswalde and Franztal in the Neumark; others immigrated to Deutsch-Kazun about 1780 and still others to Volhynia in the early 19th century. These emigrations appreciably decreased particularly the number of Flemish Mennonites in this area. The Dutch Naamlijst from 1743 to 1802 also names the ministers in the Schönsee congregations. In the Old Flemish congregation the ministers were Laurens Sperling, elder 1760; Peter Pancratz, preacher 1760; Jacob Wedel, preacher; Peter Jantz, preacher 1773; the Naamlijst of 1780 names only Peter Pancratz; in 1786 Pancratz is missing; the preachers are Benjamin Wedel and Tobias Jantzen, both appointed in 1785. The list of ministers of the Frisian congregation is more complete; they were Peter Dirks before 1743-ca.1758; Gabriel Frantz, Sievert Tjart, Jan Siebrandt before 1743-ca.1750; Peter Nickel before 1743-ca.1780; Cornelis Frantz, elder ca.1750-1758; Andries Gertz, preacher ca.1750-1762; Hendrik Cornelissen 1757-1759; Peter Tjart 1757-1762; Gertgen Knoop 1759-ca.1781; David Battel ca.1752-1765; Cornelis Frantz, preacher 1763, elder 1776-ca.1788; Heinrich Siebrandt 1786-? ; Peter Baltzer 1771-ca.1796; Jacob Gertz 1775-ca.1798; Heinrich Tjart 1788-after 1802; Timotheus Boltz 1788-after 1802; Jacob Frantz, preacher 1791, elder 1794-after 1802. On 12 October 1849, the small Old Flemish congregation of Schönsee, then numbering 39 souls, merged with the Frisian congregation. The Flemish meetinghouse was abandoned; the old Frisian meetinghouse of 1618, somewhat remodeled, was used until 1945. The united Schönsee congregation numbered 364 baptized members in 1852, 320 in 1880, 273 in 1927, 179 in 1941. Johann Stobbe, preacher 1851, was elder 1875-1906, Johann Bartel, preacher 1898, elder 1906-45(?). The congregation had its own home for the aged. In the spring of 1945 with the coming of the Russian armies the congregation of Schönsee was wiped out. "Bezoekreis van Hendrik Berents Hulshoff aan de Doopsgezinde gemeenten der Oude Vlamingen in Pruiseo en Polen." Bijdragen en Mededeelingen van het Historisch Genootschap 49. Utrecht, 1938: 32-82, particularly 64, 76 ff., 80. Hoop Scheffer, Jacob Gijsbert de. 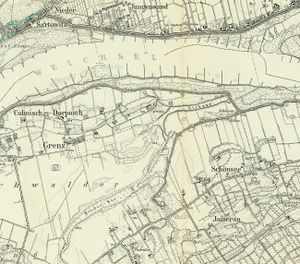 Inventaris der Archiefstukken berustende bij de Vereenigde Doopsgezinde Gemeente to Amsterdam, 2 vols. Amsterdam: Uitgegeven en ten geschenke aangeboden door den Kerkeraad dier Gemeente, 1883-1884: v. I, particularly Nos. 1097 ff., 1581, 1597, 1599 ff., 1604 ff, 1611-14, 1641 ff., 1647. Mannhardt, H. G. Jahrbuch (1882): 17, 19. Mannhardt, H. G. Jahrbuch der altevangelischen Taufgesinnten oder Mennoniten (1888): 15. Mennonite Life 10 (April 1955): 76, 78. Mennonitische Blätter (December 1939): 75 ff. Mennonitischer Gemeinde-Kalender (formerly Christlicher Gemeinde-Kalender) (1941): 145. Mennonitische Geschichtsblätter 4 (1939): 34-36. Naamlijst der tegenwoordig in dienst zijnde predikanten der Mennoniten in de vereenigde Nederlanden. Amsterdam, 1743-1802. Wiebe, Herbert. Das Siedlungswerk niederländischer Mennoniten im Weichseltal. Marburg a.d.Lahn, 1952: 8, 35 ff., 37, 56 note 45, 57 note 16, 81 ff., 87-91, 95 ff. Wolf, Hans-Jürgen. "Familienforschung in Westpreußen." Web. 29 September 2012. http://www.westpreussen.de/cms/ct/ortsverzeichnis/details.php. Zijpp, Nanne van der and Richard D. Thiessen. "Schönsee (Kuyavian-Pomeranian Voivodeship, Poland)." Global Anabaptist Mennonite Encyclopedia Online. September 2012. Web. 25 Apr 2019. http://gameo.org/index.php?title=Sch%C3%B6nsee_(Kuyavian-Pomeranian_Voivodeship,_Poland)&oldid=163096. Zijpp, Nanne van der and Richard D. Thiessen. (September 2012). Schönsee (Kuyavian-Pomeranian Voivodeship, Poland). Global Anabaptist Mennonite Encyclopedia Online. Retrieved 25 April 2019, from http://gameo.org/index.php?title=Sch%C3%B6nsee_(Kuyavian-Pomeranian_Voivodeship,_Poland)&oldid=163096. Adapted by permission of Herald Press, Harrisonburg, Virginia, from Mennonite Encyclopedia, Vol. 4, pp. 475-476. All rights reserved. This page was last modified on 28 January 2019, at 20:14.